The Monastery of Saint Samuel the Confessor in Egypt’s western desert. In May 2017, gunmen wearing military fatigues opened fire on three buses that were traveling near the monastery.— Islamic State gunmen killed at least seven Coptic Christian pilgrims in Egypt on Friday and wounded at least 16 in an attack. 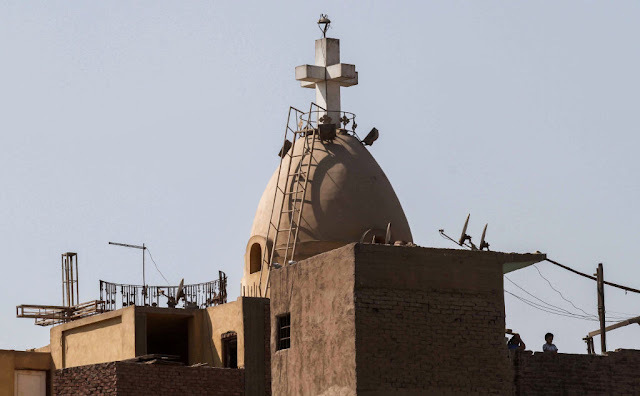 President Abdel Fattah el-Sisi, has vowed to protect Christians, a minority in the country, from attack. The shooting occurred as two buses carrying pilgrims left the Monastery of Saint Samuel the Confessor, 85 miles south of Cairo, in Egypt’s Western Desert. The gunmen opened fire. One of the buses managed to speed away, but the other, in which the seven people were killed, did not. People were injured on both buses. Visits to desert monasteries, are popular in the religious practice of many Egyptian Copts, who make up an estimated 10 percent of the country’s population.